Road trips make for the best memories. There’s just something about piling in one vehicle and going back and forth between signing at the top of your lungs and fidgeting to assume the perfect napping position. Rash decisions, wrong turns, haphazard restroom stops and the best conversation topics have a special way of uniting each passenger. If you don’t know someone well, hop in the car with them for a few hours and you will become quickly acquainted. But let’s not forget the heart and soul of a true road trip. The snacks. Loading up on goodies to sustain you through hours in the car is honestly one of the best parts. As kids, our go-to picks might have been Honey Buns with the occasional can of sour cream and onion Pringles if we were feeling extra carefree. Now, many of us have a slightly deeper appreciation for nutrition and are looking for a road trip snack that is just as healthy as it is delicious. Odds are, if you’re taking a trip there’s going to be lots of incredible food to eat when you get there. So how can we find road trips snacks to eat that are still tons of fun but will save room for all the food to come? Here’s a list of five road trip snacks that are healthy, delicious and won’t send you overboard before you even get to your destination! This snack is new to me but has become a quick favorite! 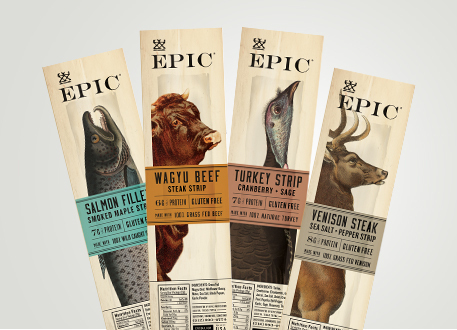 Think of them as a gourmet Slim Jim. The salmon maple is wonderful and has a slightly sweet flavor from maple syrup. The spicy chicken bar is also great for sticking in your purse and grabbing when you want something filling but lower in calories. This bar has only 100 calories but packs 15 grams of protein. This stuff is not only fun to say but is extremely addictive. With flavors like white cheddar, sweet & salty kettle corn, sweet barbeque, Chile lime and sea salt there’s always something new to try. If you have a sweet tooth, try milk chocolaty peanut butter or cinnamon roll. SO YUM. Do you ever find yourself curious about a product at the grocery store but hesitant to try it? 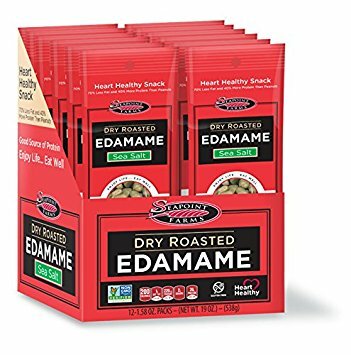 This dry roasted edamame was that product for me. But, I went for it and became a huge fan! This snack packs 13 grams of protein for each serving so it really sticks with you. Plus, major points for finding ways to get your veggies in on a road trip. Ok, this granola has a special place in my heart. It tastes JUST like a good ole box mix brownie and I’m convinced you won’t be able to get enough once you try it. It is packed with oats and chia seeds. and sea salt always takes sweets to new heights, so this granola really checks all the boxes. Lara Bars are known for containing small lists of ingredients and these bars are no exception. Strawberries, spinach, cashews, apricot and apples make up these deliciously chewy bars. It’s hard to find a bar that doesn’t have unnecessary sweeteners but this one is completely guilt-free and totally road trip worthy. The flavor is subtly sweet from the fruit but not overly sweet. The strawberry flavor really comes through and the cashews add a nice texture. Happy travels and happy snacking!